This odd compilation mixes and matches recordings by the American pianist Grant Johannesen (who died in 2005) and English conductor Sir Eugene Goossens. Johannesen, who was born in Salt Lake City, was closely associated with the French repertoire, and he is a natural in the works by d'Indy, Fauré, and Saint-Saëns. (In fact, he recorded the complete piano works of Fauré.) 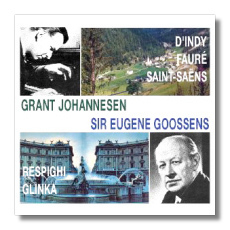 Eugene Goossens was the son and the grandson of conductors, also named Eugene, and he conducted orchestras in Rochester (New York), Cincinnati, and Australia. He made many recordings; several on the Everest label were transferred to CD, but are now out of print again. Until recently, I did not find him to be a particularly exciting or even interesting conductor, so I am glad that ReDiscovery has released further evidence to the contrary. I have yet to hear a recording of the d'Indy that I dislike – it is such an adorable piece. Johannesen and Goossens sparkle their way through it, savoring it as if it were the first warm day in spring. Not even the faint rumble of the LP from which this recording was taken puts a damper on the music. The more sober Fauré is no less successful. Camille Saint-Saëns' little "caprice-valse" known as Wedding Cake was composed as a present for one of the composer's colleagues. Like the d'Indy it is completely irresistible, although it seems to be constructed almost entirely of whipped cream! Johannesen makes us forget that the piano is a percussion instrument; he seems to conjure the notes right out of the air. It is not difficult to turn The Fountains of Rome into a bombastic bore. Somehow, Goossens gets more out of this piece than most conductors do. The outer sections, in particular, are given an uncommonly atmospheric treatment. Goossens' flexible treatment of tempo helps the music to come alive. Indeed, there is one point near the end of "The Fountains of Trevi at Midday" where he and the London Symphony seem to surge forward spontaneously, almost recklessly. It is a little messy, but deliciously exciting. Glinka's Jota Aragonesa also can be a yawner – a catalogue of Spanish clichés. Fine engineering (also a feature of the Respighi) helps Goossens to make a splash here anyway. Even though I'm not convinced that this is great music, Goossens' pointed and colorful reading gives the music stature. Again, the source for these recordings appears to have been LPs, but ReDiscovery's David Gideon has done a superb job of readying the source material for this release. This no frills CD-R may be ordered from www.rediscovery.us for $15, which includes shipping.